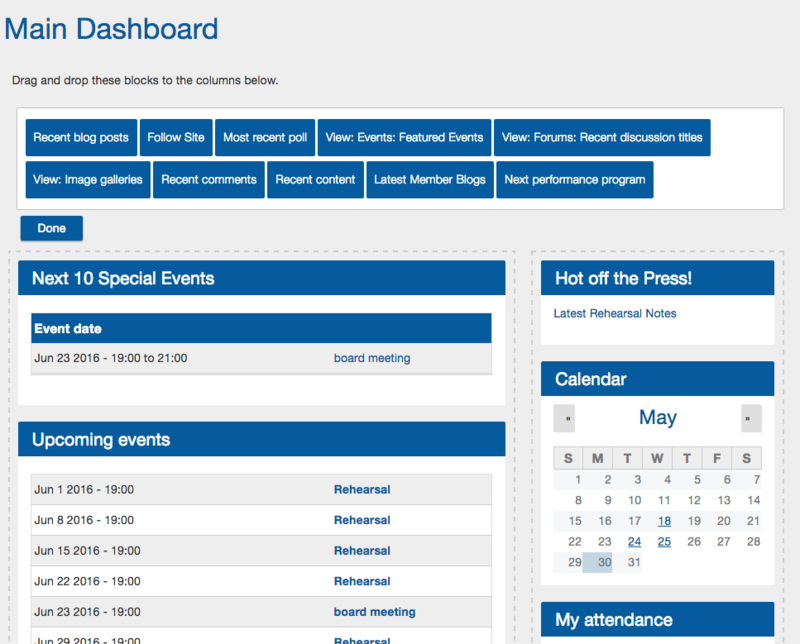 The dashboard is the place where you can catch up on the latest happenings within your group all in one easy place! The dashboard is customizable by site admins, allowing you to choose what appears and where it is placed. Please note, the dashboard that you configure is visible to all users - there is only one layout for everyone. However, content in the blocks used on the dashboard will change according to the roles of each user. It's right below the "main dashboard" title. It is not available on mobile devices. This will open an area with various block options. You can then drag and drop those blocks into the two content areas of the dashboard. If you wish to remove a block from the dashboard, grab it by the title and drag it back into the block box at the top of the screen. Click the "Done" button to save your changes. These "smart" blocks will automatically fill with the most recent content as you begin to use the site. Any custom blocks you create will also appear as options for the dashboard.